The Longmeadow Fire Department does not have a ladder fire truck. 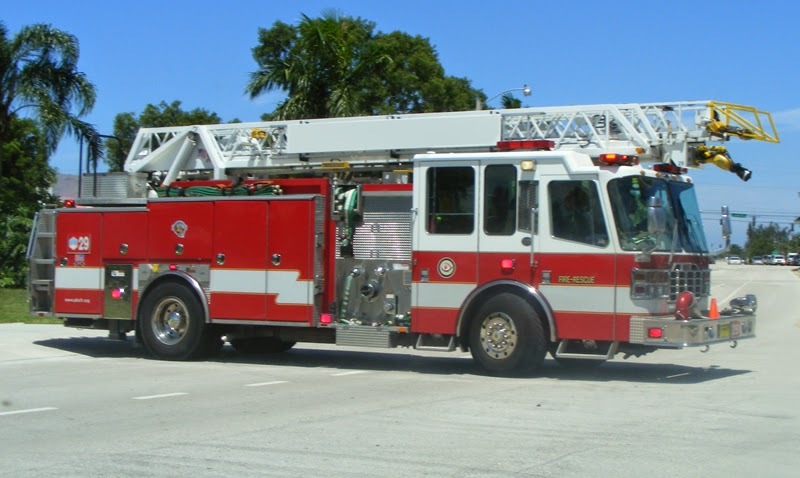 When a fire requires aerial firefighting capabilities or a rescue that cannot be safely accomplished with a ladder leaning against the burning structure, the department must call on a neighboring community’s fire department to respond with their ladder truck. A year and a half ago during the major house fire on Frank Smith Road the response time was 20 minutes. Not having a ladder truck puts our residents and firefighters at risk. Several years ago a firefighter fell through the roof fighting a fire. Longmeadow has several large structures in town that require aerial fighting capabilities from the churches to the various public and private schools. We also have several institutions in town that require special care in responding to fires such as Bay Path University, Jewish Geriatric Nursing Home, and Glen Meadows. Each of these institutions has pledged funds towards the purchase of a ladder truck. The last warrant article at the Town Meeting will be the purchase of the ladder truck for the fire department using the Fire Truck Fund, the pledges from town residents and organizations, and free cash. Please come to town meeting on Tuesday, November 18th at 7 PM and have your voice heard on the purchase of this vital piece of firefighting equipment. To see if the Town will vote to authorize the purchase of the Quint Fire Truck, an aerial firefighting apparatus with ladder capabilities at the cost of $752,000.00, or a greater or lesser sum, using the fire truck funds, previously approved by Town Meeting for the purchase of a fire truck, pledged donations and certified free cash expected to be $262,000.00, or a greater or lesser sum, or take any other action relative thereto. To request the purchase of the Quint Fire Truck, an aerial Firefighting Apparatus, which includes a ladder, during the fall 2014 special meeting. The truck will be purchased using the Fire Truck Fund, the special donations that have been pledged and the balance to be paid for with the certified free cash. 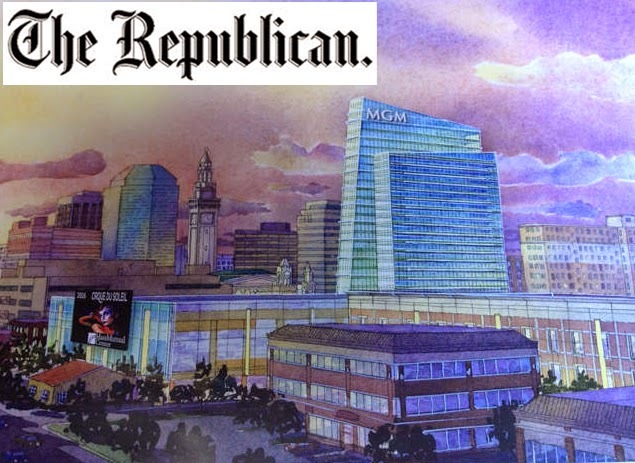 Springfield Republican Opposes Casino in Massachusetts may seem contradictory to recent support expressed by The Republican newspaper for the proposed Springfield- MGM casino. However, below is an 2008 Republican editorial expressing their opposition to casino gambling in Massachusetts. Odds of so-called "resort" casinos delivering busloads of tourists to attractions outside the perimeter of the gambling complexes are slim to none. While supporters of Gov. Deval L. Patrick's proposal to establish three casinos - including one in Western Massachusetts - say casinos would provide an overall boost to tourism, that hasn't happened in Connecticut. Just ask Ledyard, Conn., Mayor Frederic B. Allyn Jr., who governs in the shadow of Foxwoods casino. Beyond the two Dunkin' Donuts shops along Route 2, Allyn said, the 45,000 people who visit Foxwoods daily are "not stopping for anything." During an interview for The Republican's four-part series "Rolling the Dice," which concluded yesterday, Allyn complained that the presence of a casino hasn't helped Ledyard a bit. He said his town of 15,000 residents still struggles to pave roads and repair infrastructure. Taxes are high - averaging $10,000 - and have driven many retirees away, he said. If a "resort" casino were to be built in Palmer, as one would-be developer proposes, it's unlikely that casino-goers would stray from the confines of the casino. To suggest that tourists might expand their visit to the region to take in such attractions as Springfield's Naismith Memorial Basketball Hall of Fame or the museums at the Quadrangle is ridiculous. There's no more unlikely conversation than the following: "Hey, let's hit the casino, then drive to the Museum of Fine Arts in Springfield, and then go to the Student Prince for dinner." We believe in calling a spade a spade. Hopes that casinos will pump up local economies are false hopes. VOTE YES ON QUESTION 3! On May 13th at 7:00 pm Longmeadow will hold its annual town meeting. This year it will be especially important for residents to come and have a voice in the decisions being made on the town budget. The town manager, Stephen Crane, the Departments, and committees worked hard this budget year to go from an over $600,000 projected deficit to a balanced budget that allowed for increased hours at the Adult Center and a new program in the elementary schools costing over $500,000. 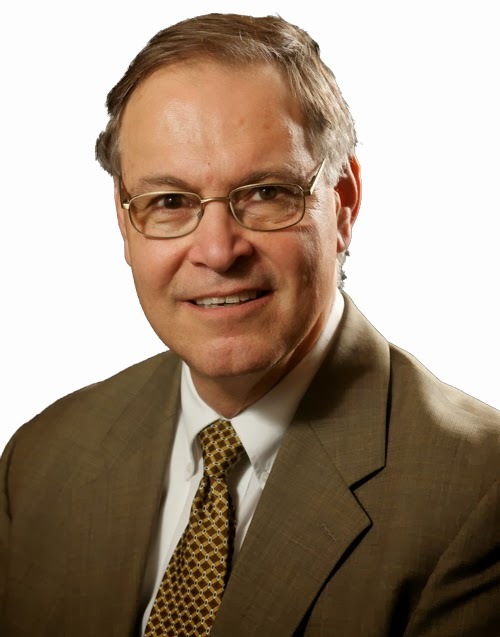 This balanced budget was $170,000 under the 2 ½ percent tax levy. The extra money was put towards infrastructure. As you may have read in the papers, residents have not been happy with the School Committee’s decision to fund the literacy program in the elementary schools and charge tuition for full day kindergarten. The superintendent had a series of meetings emphasizing the importance of full day kindergarten, but prioritized funding for the “literacy program” instead that replaced teacher’s aides with certified teachers in each of the elementary schools to improve test scores. At town meeting there will be an amendment on the floor asking for an additional $400,000 in the school budget to eliminate the tuition for full day kindergarten. The residents believe that the funds in the Town’s Operational Stabilization Fund and/ or Free Cash should be used to pay for the tuition. I will be speaking against the amendment. The Free Cash being referred to as a funding source is the projected Free Cash that is will not be certified until the Fall. Responsible fiscal policy is that any projected, Free Cash (unused funds budgets and projects) should not be used until certified after FY14 in September and that the money be used for non-recurring expenses such as Capital or emergencies such as the October 2011 storm. The Town also has a policy that states any unobligated Free Cash over $500,000 be placed in the Operational Stabilization Fund. Rating agencies such as Moody’s look very poorly on the use of projected uncertified Free Cash to balance an operating budget. Rating agencies recommend that a town have 5-10% of the general fund expenditures in the Operational Stabilization Fund. We are at 6%. By ignoring our own fiscal policy and municipal finance best practices and use the Operational Stabilization Fund or uncertified Free Cash to balance an operating budget, we risk our credit rating and risk higher costs for borrowing in the future. For the above reasons, if the amendment to fund full day kindergarten passes, the Select Board will be obliged to cut programs and staffing on the general government side of the budget. These are programs that benefit the entire town. The cuts will be noticeable and, in some cases severe. Raising taxes does not appear to be a reasonable option; taxpayers have already absorbed an increase in taxes to build the new high school. Unfortunately, the choices here are difficult. If the residents want to cut programs, hours, and staffing to support a full day free kindergarten, the Select Board will move ahead with those cuts. In either case, the will of our community will prevail. I urge all of you as citizens to come to the Town Meeting and have your voice heard and your vote counted in this very important matter. 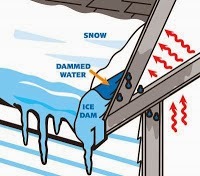 Driving around town earlier today I spotted many homes with significant ice accumulation on rooftops suggesting that we may be going to enter a period of homeowner problems relating to "ice dams". Imagine my surprise when I read Alex Grant’s opinion article in the January 23, 2014 Longmeadow News (see below for article) and once again found out the that majority of the Select Board was wrong when we voted to apply for a $155,000 Green community grant to begin to purchase and install high efficiency street lights. 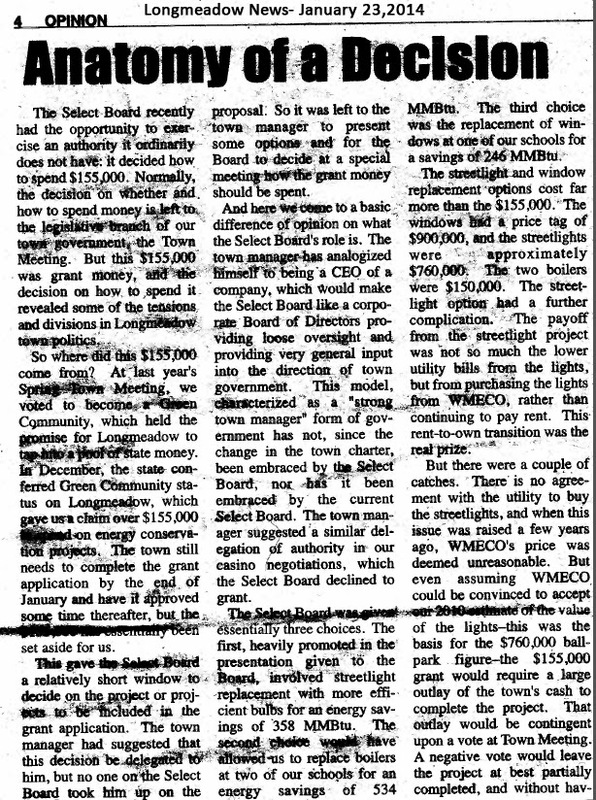 Reading Mr. Grant’s opinion, it is inconceivable that a majority of the Select Board would vote differently from him, particularly because the “facts” so clearly favored his preference: the replacement of school boilers. 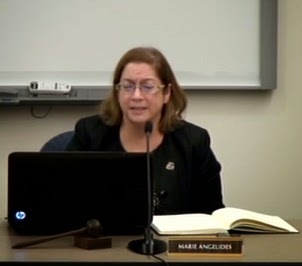 Just in case there are readers of the Longmeadow News who did not watch the Select Board debate on this issue (see video clip below), it is probably worthwhile to have the “facts” that supported the majority position reviewed fully in this forum. The primary factors that were taken into account when the potential subjects of our Green Community grant were under debate were: Benefits and breath of impact on the community; cost savings; and ability to extend the grant through annual reinvestment. The conversion of street lights to high efficiency lighting was, in the opinion of the majority of the Select Board members, clearly advantageous over boiler replacements in all three areas. Benefits and Breath of impact: The upgrade of street lights is a program that has been studied by independent consultants, town employees, and the Select Board several times over the past 5 years. There is no alternative way to achieve the projected $600,000 in annual savings in the street light line of our budget other than the proposed project. Demonstrated benefits of the program include both cost savings and improved safety for all town residents. Every street and every resident has the potential to benefit from the lighting changes as well as the cost savings. Contrast this impact with the replacement of school boilers whose savings potential is not only lower, but is a predicated on a project that has not been evaluated, or for that matter even appeared on any previous list of capital needs, and for which a repair alternative that may be an option has not been offered. The decision to request Green Communities’ funds for street light efficiency indicates a preference for that project over boiler replacement, and does not preclude the town from pursuing truly needed heating system replacements using our capital stabilization funds when an overall plan has been developed. Benefit comparison: Mr. Grant properly quoted the relative MMBTU values projected as savings for each potential project. What was not sufficiently emphasized was the significantly higher dollar value to the town of the street light retrofit program. For anyone who has reviewed the cost of heating a home with electricity vs. natural gas, they need no reminder that it costs far more to provide the equivalent energy with electricity as it does with gas. Simply put – high efficiency lighting is a better return for the town than a boiler where the actual savings are impacted by weather, thermostat settings and other system operations. A higher efficiency boiler isn’t going to drive energy savings when, as they were during the winter of 2010, the windows of Glenbrook School had to be opened every day because the system controllers failed in “full heat” mode. Street lighting costs are based on a fixed formula (tariff) and are not influenced by any other factor besides the type of light being used (surprisingly, not even the hours per day the light is actually on – or even if it’s on at all). Annual Reinvestment: Because the lighting project saves more money, the savings from one year can be reinvested in programs that will allow us to compound our savings. A $155,000 investment in year 1 can generate savings to allow the conversion of all street lights in a +/- 5 year period. 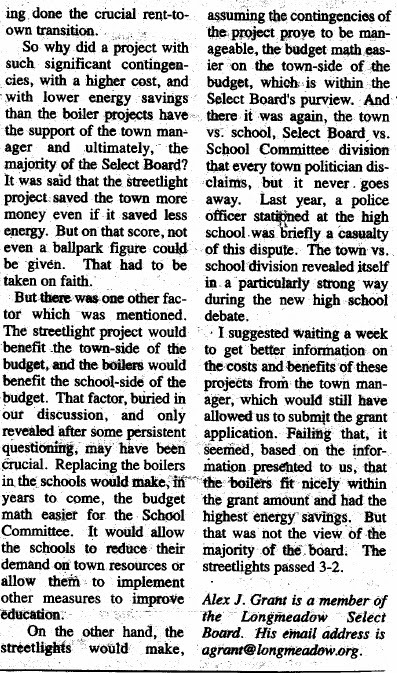 Savings in General Government costs (street lights) are in fact easier to reassign to other energy savings projects in future years than are savings to school department projects. 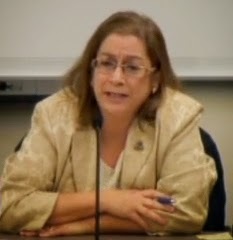 One only needs to look back at the 2013 purchase of the town-wide fiber optics network and the subsequent FY2014 debate over the $100K per year in savings the project provided for verification of the difficulty of allocating capital investment based annual savings outside of the school department budget. This past weekend the Longmeadow Select Board members attended the Massachusetts Municipal Association meeting in Boston. At that meeting we all got the opportunity to hear and see the progress that has been made on the technologies related to purchasing and high efficiency retrofitting of street lights. Such an action by Longmeadow that would have been cutting edge 5 years ago is now mainstream – if not overdue. The decision by the Select Board to pursue this project over the others that were reviewed is like many of the Select Board decisions, based on more history, debate, and evaluation than can be presented in a 700 word opinion article. I welcome the discussion and debate that accompanies the decision making process of the Select Board. I believe in the collective decision making process that comes with a five person Select Board and am disappointed that there seems to be an ongoing need to explain the majority decision beyond the televised debate that led to the vote. In my five years on the Board I have been on the minority side of several votes. During each discussion I thoroughly expressed my opinion, and after the vote I respected the opinions and decision of the majority. I would like to think that such grace in victory and defeat is not a bygone trait. I hope this letter clarifies why I support the decision to request Green Community grant funds to begin the process of upgrading the street lights throughout the town of Longmeadow. Below is the opinion column Anatomy of a Decision written by Alex Grant, Longmeadow Select Board which appeared in the January 23, 2014 edition of the Longmeadow News. Below is the LCTV video of the January 14, 2014 Select Board meeting during which there was discussion of the various energy related program candidates. On Thursday we learned that the Mass Gaming Commission voted to say that MGM is suitable to apply for a casino license in Springfield. What you won't hear on the news is that (1) the suitability is revokable at any time, (2) that the commission has the option to not award a license, and (3) that the Repeal the Casino Deal effort may be able to keep casinos out of the Massachusetts by the popular will of the people. So here's a timeline of what is upcoming, and what we're working on for the upcoming months. 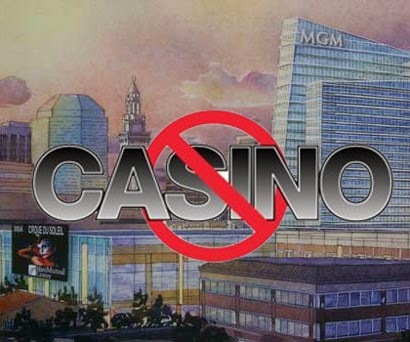 We are going to invite a member of the gaming commission to a local forum for late January/early February so they can hear from us why we think the MGC should not award a license in Springfield. We'll let you know when we finalize a date. We also are preparing to have as many speakers and a large of a presence as possible at the Springfield MGC hearing in April. They need to hear that the people don't want a casino here. Most importantly, we are continuing to work with Repeal the Casino Deal, in hope of allowing a vote in November. New York, Rhode Island, Nebraska, Maryland, and New Jersey all let their citizens decide whether to allow casinos in their state. Why should we be deprived of that voice? The State's highest court will hear the case sometime between January and April, and will hopefully allow the question on the November ballot. This is our best chance to keeping Springfield, and the entire state casino-free. We'll of course keep you posted as events unfold. For those of you in West Springfield and Longmeadow, MGM is trying hard to make Longmeadow and West Springfield look unreasonable just because the other towns took deals that do not protect their citizens. When you hear MGM say that Longmeadow is asking for 5 times what other communities took, remember that Longmeadow commissioned the studies that told them what kind of impacts are to be expected - it's not that Longmeadow is asking for 5 times more that what it will cost, it's that the other towns settled for 5 times less than it will cost them. Keep in mind that towns surrounding Foxwoods/Mohegan in CT get nearly a million dollars/year and they tell us that it's not nearly enough to cover the negative impacts casinos inflict on the towns. So be sure tell your Selectmen/City Councilors not to be bullied by MGM, but to stand up for the citizens. When you picture Longmeadow, what do you see? Most likely you picture a tree-lined street blessed with a large number of antique houses. It is a scene that has changed little over my 50 + years. Our Longmeadow Street is picturesque and historic. This location, without a doubt, is one of the most beautiful streets in Western Massachusetts. In our ever-changing world, it is vitally important to retain and preserve this iconic setting of our New England town. It is part of what draws people to live here. It is for this reason that I applaud the Select Board and citizens who created the historic district over 35 years ago. This goes a long way to preserve our unique gem we call “The Green”. It is the historic heart of our community. It is critical however that the town must consider the threats to this green. According to every realtor I have spoken with in town, it is difficult to find a buyer for an antique home. Homeowners are looking for low maintenance and energy efficiency. Antique homes often need restoration, renovation and updating. Although I am very much in favor of the historic district, it must be acknowledged that it is costly to repair a home to the commission’s standards. For example, the “Red House”, featured in the town shield, was required to use cedar shingles when replacing its roof even though the cost was over three times as much to have them. If we want to encourage families to be stewards of the lovely old homes that grace our green, we need to consider approaches to make ownership more attractive. These structures that are so important to the town are taxed at a higher level than similar homes in other parts of town rather than at a lower level. These residents should be considered partners with the town in preserving our town’s assets. I would like to see the town take steps to support their preservation or we could lose them as so many other communities in New England have done when a town no longer puts a value on conservation of historical architecture. If we are not vigilant, these houses may slowly decay and we will lose the setting of our very unique Longmeadow Street. Any increase in traffic threatens the safety of school children biking and walking to Center School. I hope this letter serves to open lines of communication between town residents and our leaders. As we know, changes are coming to nearby Springfield that could alter our community forever. This suburb is on the edge of Springfield and I-91 is located within our borders. I urge our leaders to stay strong and keep a clear vision for Longmeadow’s future that protects and preserves our historic character. This is especially important as we enter into a mitigation agreement with the proposed casino that may be built in the south end of the city, only 2-3 miles from here. The integrity of our Town Green is at stake. Please consider all the factors as we move forward with the negotiation process. Our ancestors who built this town will be proud of our efforts for future generations to come. Did you receive your FY2014/ 3Q Property Tax Bill? All residential (+ business) property owners should have received their FY2014/ 3Q real estate tax bill in the mail earlier this week. Payment is due February 3. After exhibiting 5-6% increases for the past two years due to the construction and bonding for the new Longmeadow HS, average FY2014 tax bills are only 2.7% higher than FY2013. 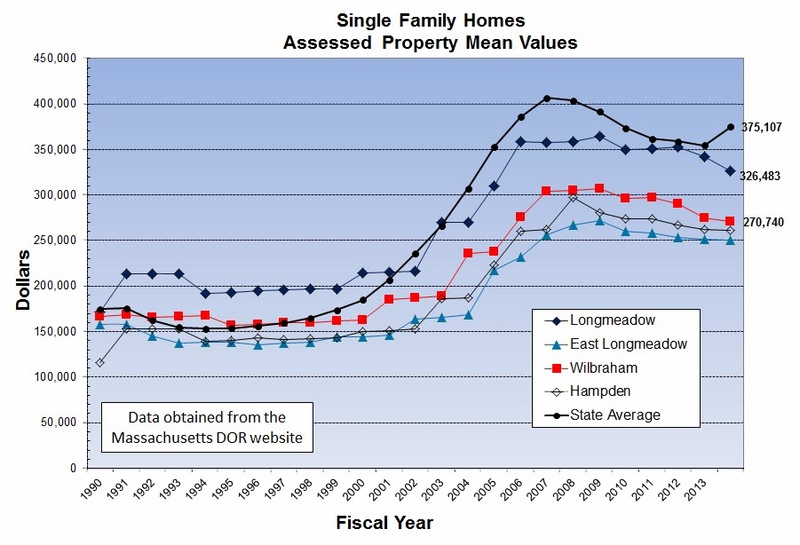 FY2014 mean property assessments in Longmeadow showed a significant drop as shown in Figure 1. Over the two past years Longmeadow assessments have decreased about 9.2% (from $359K --> $326K). It is interesting to note that the state average showed a significant increase. Remember a decrease in the average Longmeadow property assessment will not necessarily reduce your property taxes unless your decrease is greater than the overall decrease. The mil rate ($/$1000 of value) will increase to compensate for property assessment decline and the total property taxes in a given year will likely increase at least 2.5% unless the Select Board elects not to tax at the "levy limit". 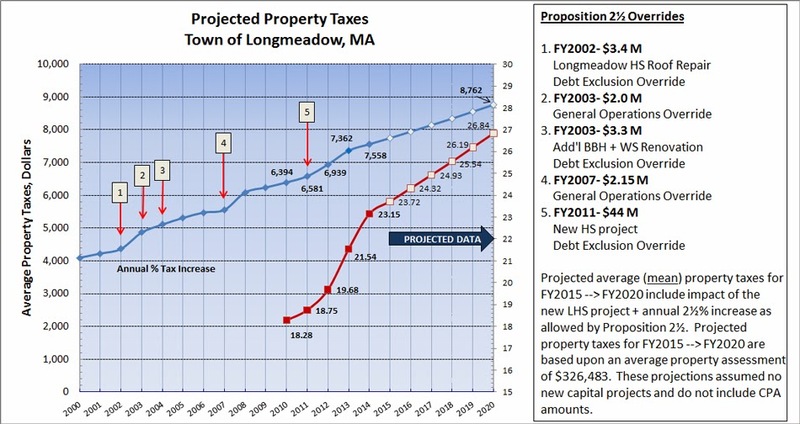 In Figure 2, both actual and predicted mean property taxes (--> year 2020, assuming 2.5% growth + no Proposition 2½ overrides) are shown for Longmeadow. 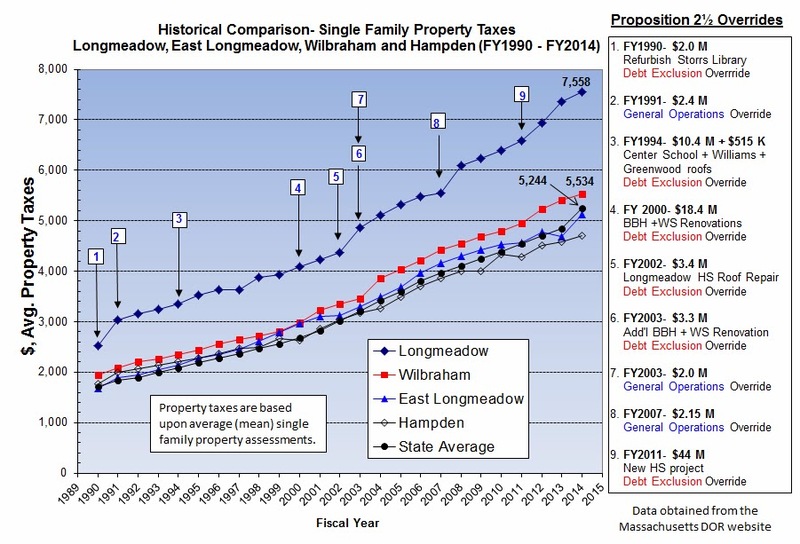 Using official published data by the Massachusetts Dept of Revenue, the following chart (see Figure 3) was created showing that Longmeadow taxes have been significantly higher ($2000- 2900 in FY2014) than the surrounding towns of Hampden, East Longmeadow and Wilbraham and the state average as well. This difference has existed for almost 25 years and it appears that the difference has been growing larger since 2002. In a town like Longmeadow where single family property values range from $120K to $1.7 million, median values (half the values are higher and half are lower) are a more useful measure than mean or average values when comparing property taxes. For FY2014 the mean value of property taxes for Longmeadow is $7558 while the median value is $6540. The State of Massachusetts as well as the Town of Longmeadow always refer to the mean value of residential property. In FY2014 the "mean" or average value for single family homes in Longmeadow is $326,500. While the Mass DOR does not publish mean property values, individuals can obtain the information from their local assessors office which I did. It turns out the "median" property value assessment in Longmeadow for FY2014 is only $282,600 (data as of December 2013). (median: 50% are higher, 50% are lower). If you think that you may be entitled to an abatement because your current property assessment is too high, read the next Buzz blog article coming soon which will explain the process and provide you with some helpful information. In the meantime you must pay your property taxes on time in order to be in the position of filing for an abatement. The deadline for filing an abatement for FY2014 is February 1. FY2014 budget discussions are already ongoing with the Select Board and School Committee. Initial indications are that there is a significant shortfall in revenue to fund even existing programs. Stay tuned to the LongmeadowBuzz blog.